Public art recognizes Historic Wintersburg and Furuta family. 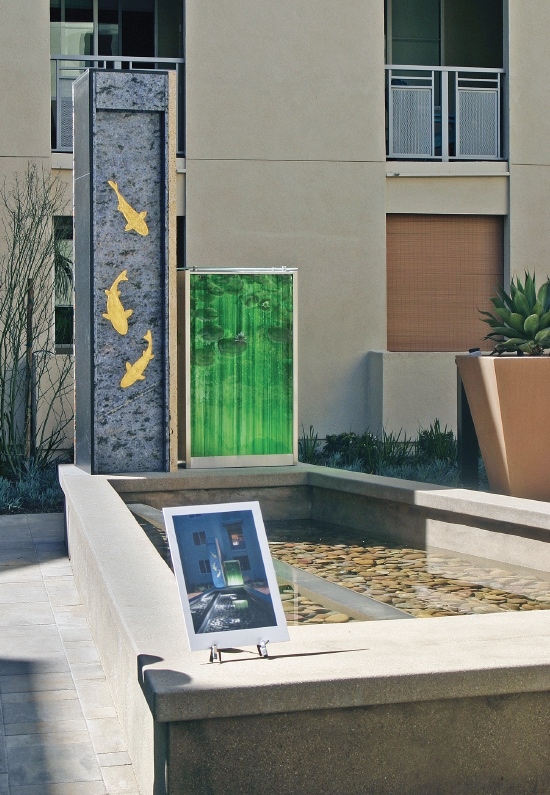 The fountain incorporates goldfish and water lily designs to pay homage to the Furuta family. 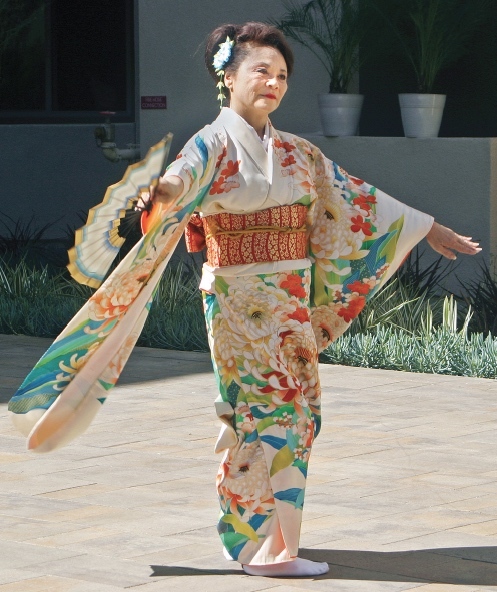 HUNTINGTON BEACH — A fountain and courtyard commemorating Wintersburg Village, which for decades was the center of the Japanese American community in Orange County, was dedicated on March 16 at Lucé Apartments in Huntington Beach. On hand for the event were descendants of Charles Mitsuji Furuta and Yukiko Yajima Furuta, who established a goldfish farm at Wintersburg. The farm was one of the few properties owned by Japanese immigrants, having been purchased prior to the 1913 and 1920 Alien Land Laws, which barred Issei from owning land. 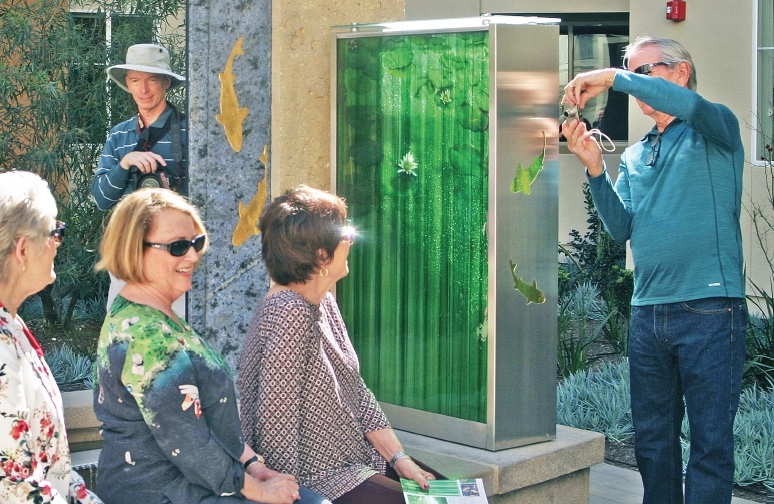 The courtyard, designed by artist Michael Davis, has a fountain featuring goldfish reliefs, blue granite symbolizing water, and lily pattern glass representing Wintersburg’s agricultural history. The fountain also suggests the flow of a rural irrigation system. 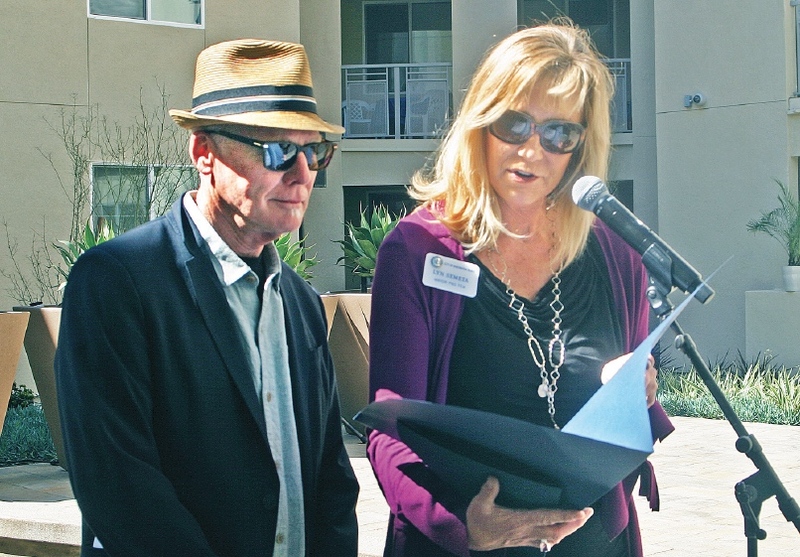 Huntington Beach Mayor Pro Tem Lyn Semeta presents a city commendation to artist Michael Davis. 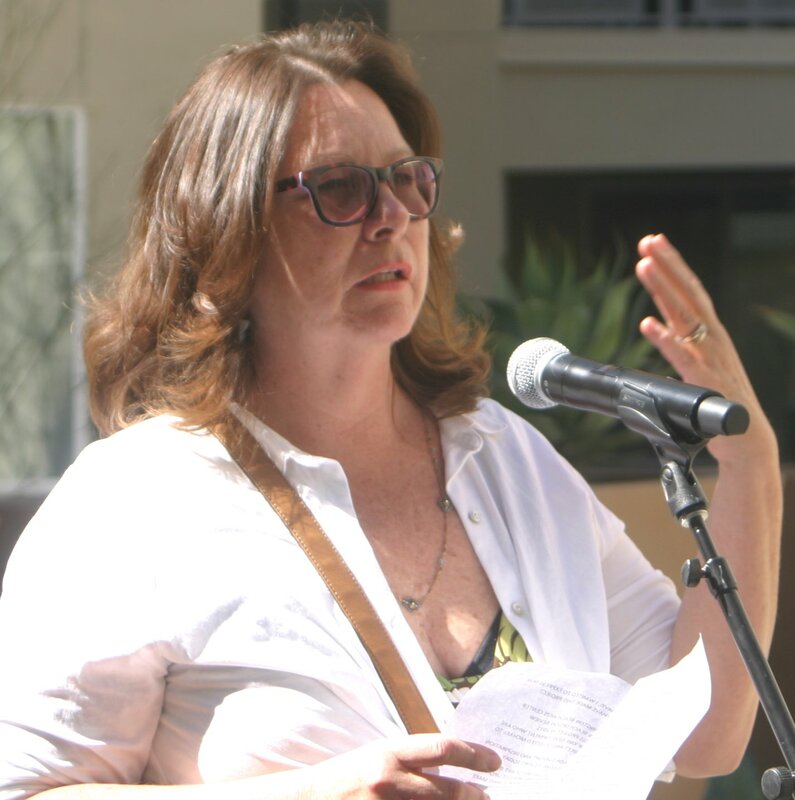 The program was emceed by Mary Urashima of the Historic Wintersburg Preservation Task Force, which is working to preserve the remaining Wintersburg structures. 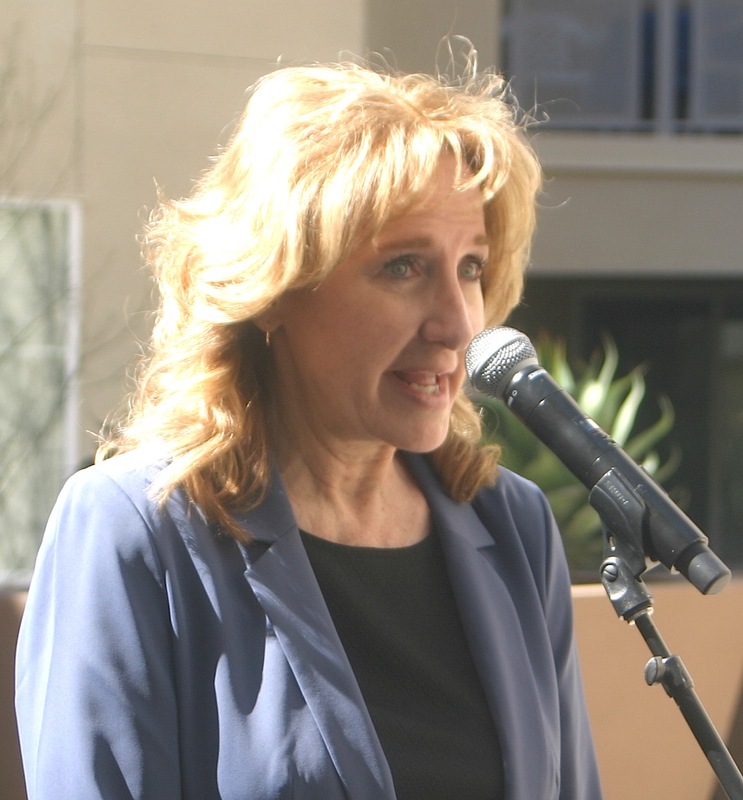 She explained that the apartment complex is in the area once known as Smeltzer and is along the Southern Pacific Railroad tracks, where farmers, including Charles Furuta, brought produce. The site is about 4 minutes north of the Furuta farm by car. Semeta presented Davis with a commendation from the city. Michael Furuta, great-grandson of Charles and Yukiko Furuta, spoke on behalf of the family members present, who included Carol Yamashiro and her husband Alan, Ron Shiraishi and his wife Judy, and Dave and Jan Furuta. 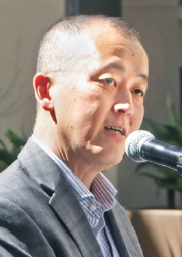 Norman Furuta, grandson of Charles and Yukiko, was unable to attend. 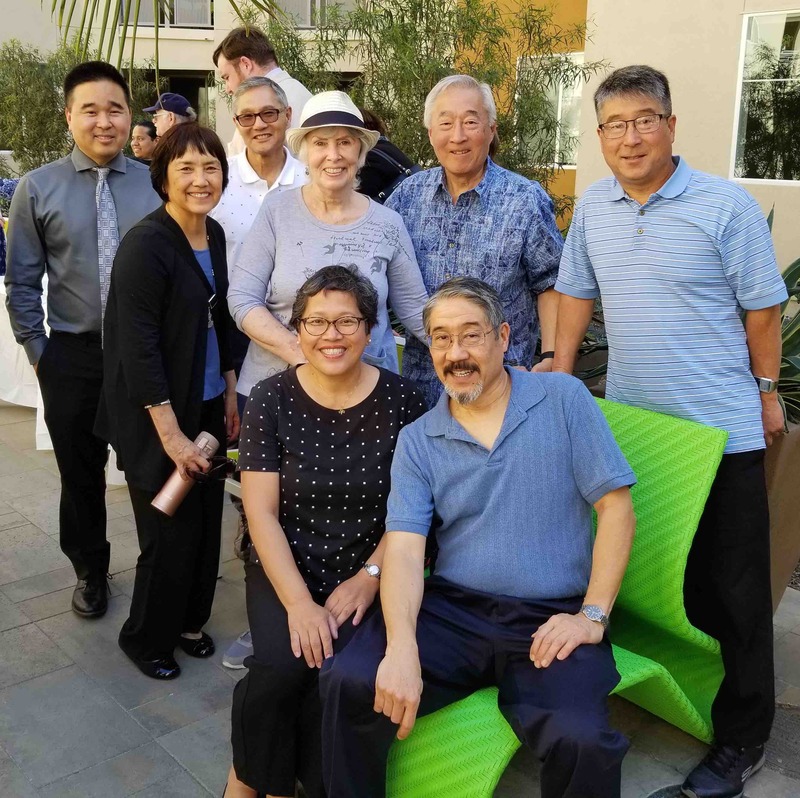 Members of the Furuta family: (back row, from left) Michael Furuta, Carol Yamashiro, Alan Yamashiro, Jan Furuta, Dave Furuta, Ron Shiraishi; (front row) Judy Shiraishi, Steve Shiraishi. “My great-grandfather, Charles Furuta, purchased five acres of farmland in what was then known as Wintersburg at the corner of present-day Warner Avenue and Nicholas Street, in 1910. He introduced goldfish ponds in the 1920s and sold tropical fish commercially until the removal and internment of Japanese Americans in April of 1942. When the family returned in 1945, it began to cultivate water lilies and sweet peas for the Los Angeles flower market for the next 50 years. Elwood said of the artist, “Michael in many ways is an observant and thoughtful storyteller. Michael has created public works throughout the United States, including San Francisco, Oregon, San Diego, Kansas City, Houston and Los Angeles … He’s lectured and taught at numerous art institutions in Southern California and continues to pursue a thriving studio practice, making objects and two-dimensional works for exhibition in Southern California galleries. In additon to crediting Urashima for “sending me her lovely book on Wintersburg, which really traces the history and talks about … the contributions the Japanese immigrants made to this community as well as the internment,” Davis thanked Mark Stirdivant of the Tuna Canyon Detention Station Coalition, which is working to memorialize a World War II confinement site. He noted that an adjoining courtyard contains the Rain/Double Fall, which incorporates water, shell stone, granite, light and corrugated glass. Nancy Hayata performs a Japanese classical dance to commemorate the occasion. The program closed with a sake toast. Special guests included City Councilmember Kim Carr; Gina Clayton-Tarvin, vice president of the Ocean View School District Board of Trustees; H. Ernie Nishii, board president of the ABC Unified School District; Kelly Rivers and Darrell Rivers of the Huntington Beach Historical Society; Frank Nakabayashi and Maureen Anzivino, co-chairs of the OC Cherry Blossom Festival. Lucé Apartments is located at 7290 Edinger Ave. Anyone from the general public who wants to see the artwork should park along Edinger Avenue. The entrance to the courtyards is at the northeast corner of the complex, facing Edinger. The public gate is open from dawn to dusk. For more information on Lucé, call (714) 465-2337 or visit http://liveluce.com. For more information on Wintersburg, visit http://historicwintersburg.blogspot.com.